The history of the moto-cross circuit at Golding Barn spans way back to the early 1950’s when the Beamish family first had races at the natural valleyed track. Run mainly, then, by the Brighton and District Motorcycle Club events included open to centre race meetings and also the famous Sunbeam Point to Point race was twice held there. For those interested in a quick trip down memory lane, riders gracing the circuit with their presence included Geoff Ward, Brian Stonebridge, Johnny Draper, John Avery, Graham Beamish, Geoff Smith, Brian Martin, John Giles, Gordon Jackson, The Rickman Brothers, The Sharp Brothers and many many more top names of the time. Spectators back then would even have seen the great Dave Bickers riding as a junior!! The circuit has been used ever since with all sorts of events being held on many different track layouts. There were numerous Schoolboy National events held during the 70s and 80s with such names as David Thorpe, Kurt Nicol, Andy Nichols, Kelvin Tatum (multi-World Longtrack Champion since then), Steve Beamish and again many more top names racing at the front of the pack. The circuit has hosted the 250cc British Championship during the mid to late 80s with the likes of Jeremy Whatley, Rob Herring, Dave Watson, Mark Bennett, Mark Banks and Perry Leask all battling for the honours. There has been some very sucessful evening meetings and many smaller events since then with some great races. The most radical changes at Golding Barn Raceway have happened in the last three years when Dan and Steve Beamish, Grahams sons, have taken on the full time job of turning the venue into a professionally run practice and race centre. The circuit has come down off of the steep hillsides in a bid to fit in with the environment a little better and a massive effort has been made to grass all non track areas and literally hundreds of trees have been planted around the site. With lots of further improvements planned both on and off the circuit it is hoped the legacy of the Golding Barn Raceway will continue for many more years. 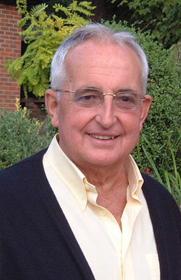 It is with great sadness that we inform you of the unexpected passing away of Graham Beamish. Though Graham had spent the last few years bravely fighting off some serious illnesses and setbacks, his final farewell still came quite unexpectedly and quickly. Graham passed away on the evening of Thursday 7th September 2006. He leaves behind an amazing life which he lived to the full and has been a great role model and huge inspiration to many, many people, not least his wife Joyce and three children Julie, Steven and Daniel. With the most fantastic memories we bid this great man a final goodbye and pray that he can now forever Rest In Peace, with all our love.